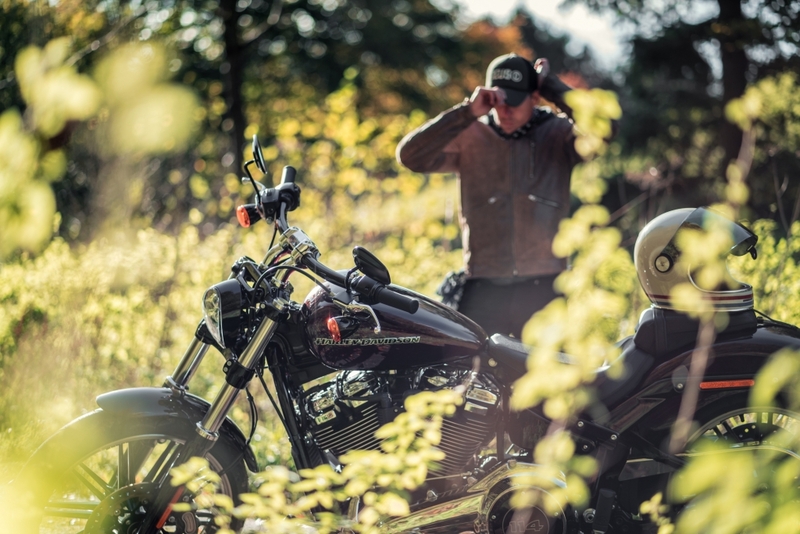 There is something strangely alluring about riding a motorcycle that boasts an engine with a displacement figure that’s greater than the family car that graces the driveway. Harley has always been an advocate of the “bigger is better” way of thinking but its 2018 line-up features the beefiest engine the American marque has ever produced. 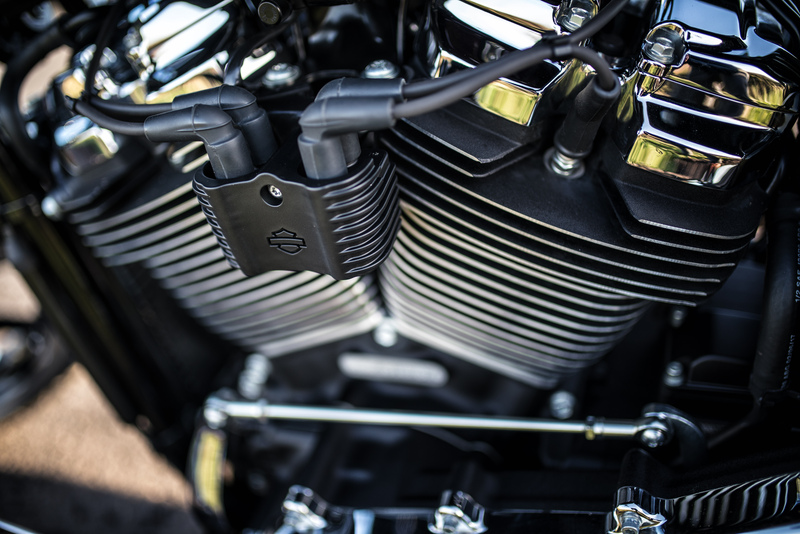 Nestled in the centre of the long, low and insanely burnished Breakout model is the latest Milwaukee 114 powerplant – a 1,868cc brute that kicks out 155Nm of torque and features a plethora of innovations to ensure its smooth to ride and well behaved on the open road. Also new for 2018 is a neat LCD display that sits on the handlebar risers for a super clean look, an adjustable rear shock and a stiffer chassis that is said to improve the handling characteristics of this two-wheeled behemoth. 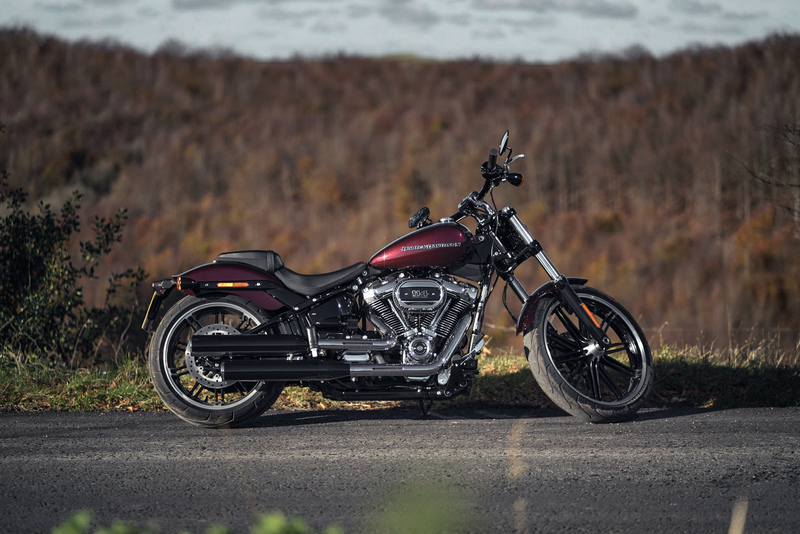 The model forms part of Harley’s 2018 softail line-up but the imposing Breakout is arguably one of the most eye-catching in the entire range. It sits just a few centimetres off the road, packs an impressive 240mm wide rear tyre and enough blinding chrome to sate any avid polisher’s appetite. 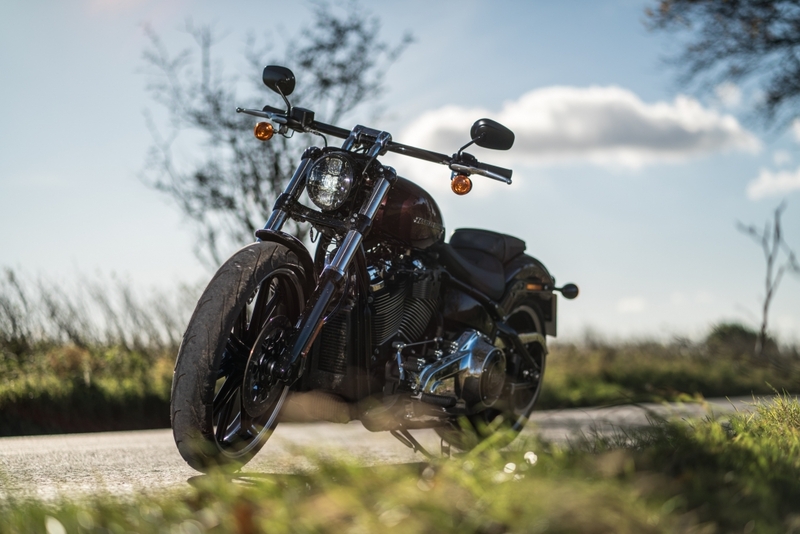 The bars are set wide, while the 665mm seat height means the rider adopts the classic Bobber riding position, with bum dug deep into the leather pew and arms outstretched like a human sail. It’s a good job the seat is nicely contoured, because it’s one of the only things stopping the rider sliding rearwards when the taps are fully open. 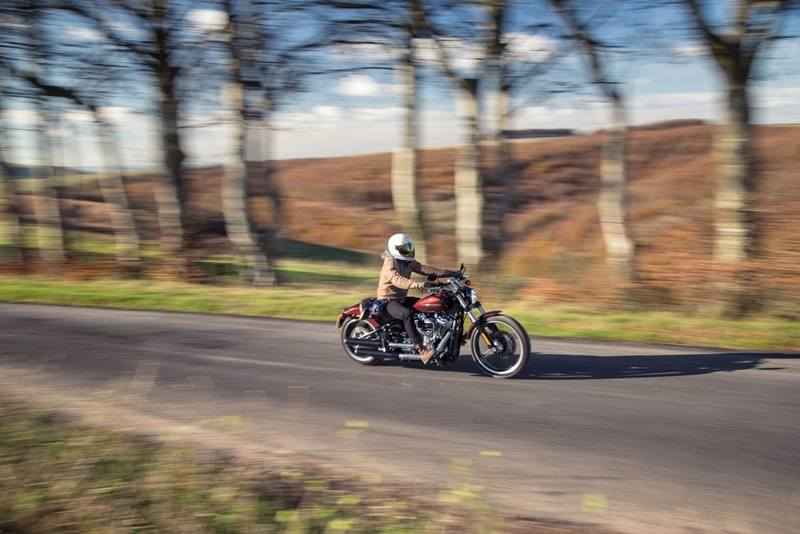 Despite the mammoth proportions of the engine and frame, the new Breakout remains a fairly easy bike to swing a leg over, even for a complete short arse like your humble reviewer. However, with 305kg and 2,370mm of metal to lug around, low speed manoeuvring can be a bit of a pain in the posterior but anyone used to Harley’s loveable giants will be well versed in the awkward car park shuffle. The model we happily rode for a week came decked out in a deep burgundy paintjob with subtle black pin striping and a slick 21-inch ‘Gasser’ alloy rim at the front (18-inches at the rear). It didn’t fail to turn heads wherever it went but with a price tag of nearly £19k, we couldn’t help noticing that some of the finishing touches were a tad cheap. 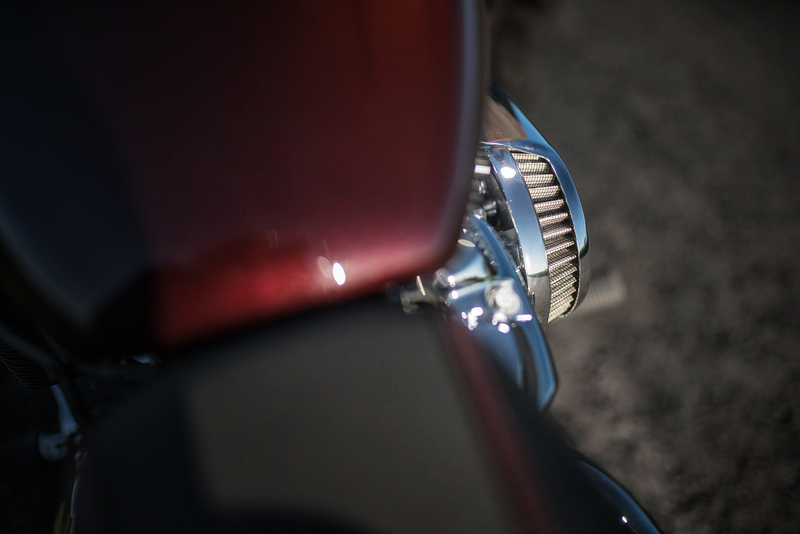 The plastic rear plate hanger, for example, could have easily been fashioned from metal, while the indicators used bulbs rather than the slick LEDs found in the brilliantly dazzling headlight design. Still, you can’t fault the over aesthetic: it’s a great blend of raking lines, bling touches and all-out muscle. The most notable addition to the latest Breakout is the cool LCD display that replaces the old clocks and gives pin-sharp read outs on speed, fuel levels and much more. 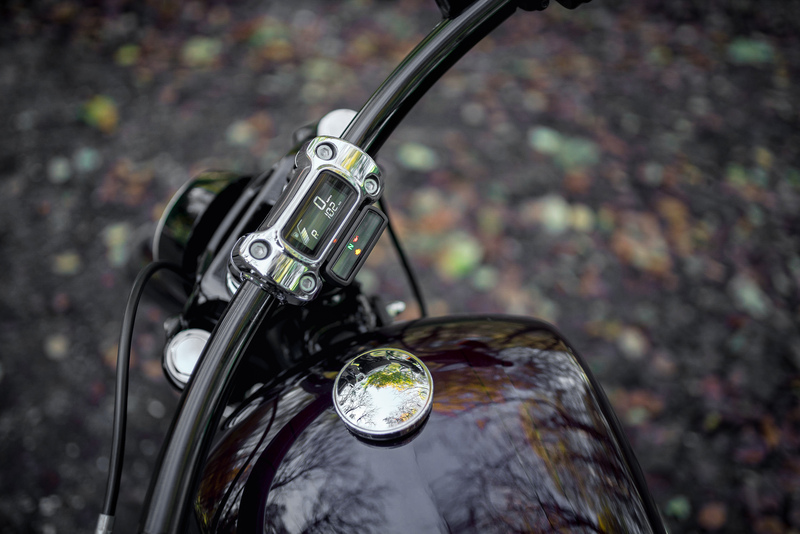 It forms part of the riser clamp and results in one of the cleanest cockpits we’ve ever seen on a motorcycle, while a thumb toggle next to the left hand grip cycles through an array of vehicle information displays. 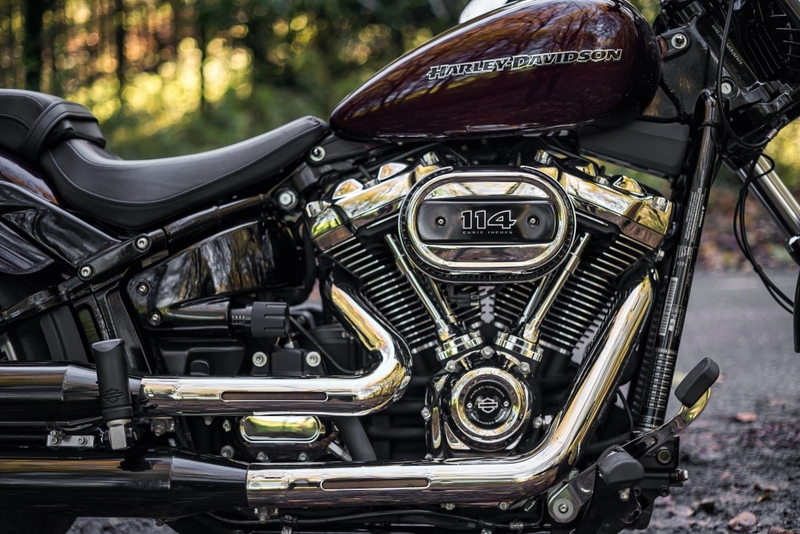 Under the skin, there’s a new engine counter-balancing system that is designed to reduce some of the shake experienced when riding a big Harley. It’s certainly palpable but there’s no getting away from the fact that the new 114 engine is still a big lumpy old lump. There’s also a new Showa dual-bending valve in the front forks and an easily adjustable monoshock at the rear. You can’t fault the suspension system, as it manages to smooth out even the harshest surfaces and results in an extremely comfortable ride, even at higher speeds. 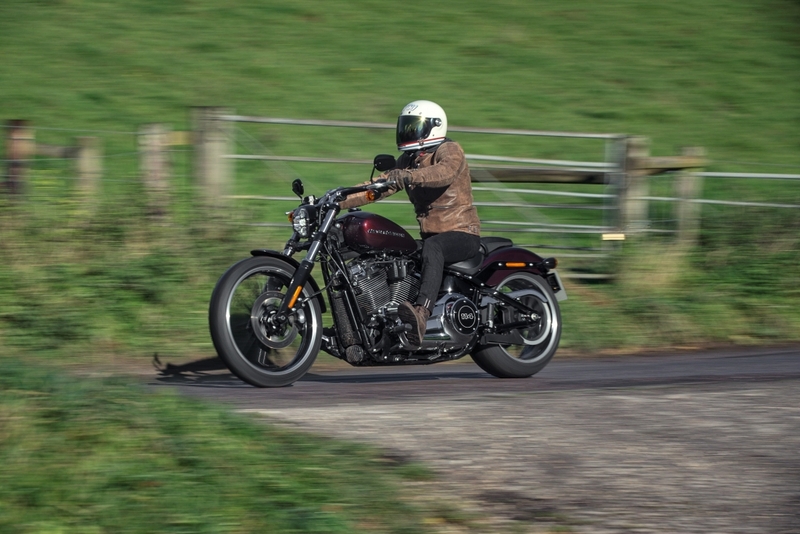 Of course, Harley throws in ABS braking as standard (there’s a lot of mass to stop, after all) but we couldn’t help thinking some form of traction control system wouldn’t go amiss, especially in this price bracket. 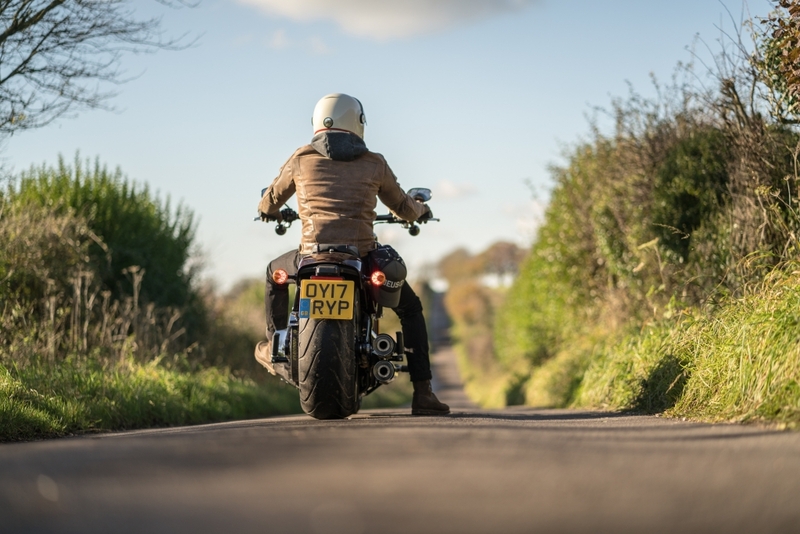 The monster rear tyre certainly offers and XL contact patch that inspires a decent amount of confidence through corners but the enormously powerful engine sees it spinning up when setting off with too much haste in slippery conditions. You can imagine that an elongated frame and a sub-30-degree lean angle doesn’t exactly bequeath the Breakout with sportsbike-esque handling prowess but there’s a certain challenge to tackling ribboning tarmac on this beast. 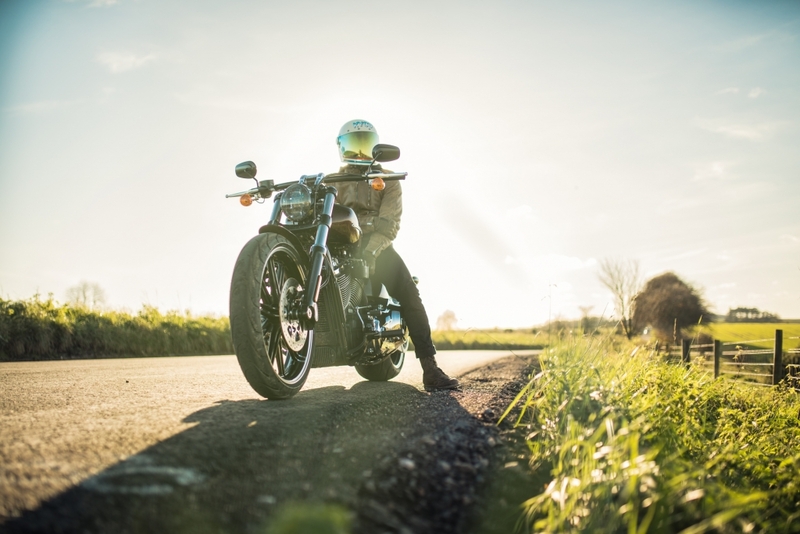 Get the big Harley on an open stretch or road and it really comes to life, with that huge engine offering bags of power throughout the rev range for easy overtakes and giggle-inducing blasts towards the horizon. 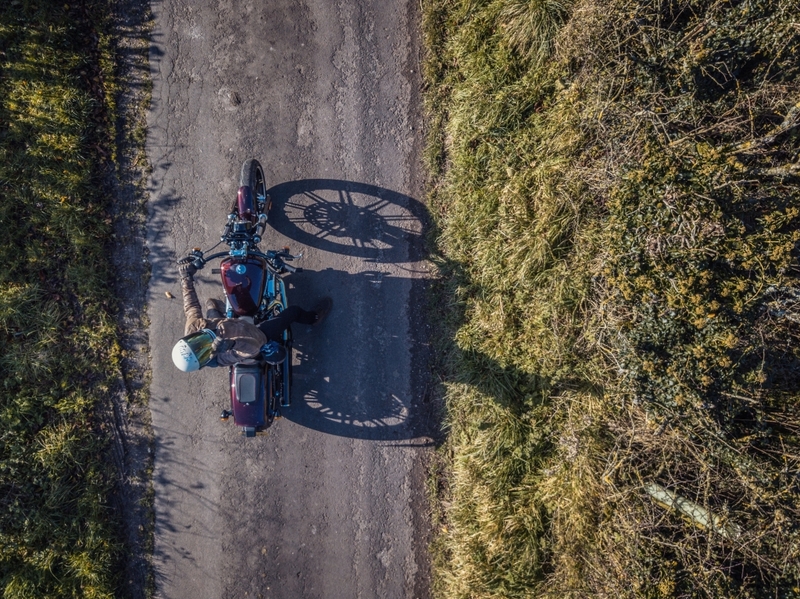 On the long, winding route of our test ride, which took us through some of Dorset’s finest scenery, we found it strangely relaxing, that big engine beating away underneath. However, despite the engines torque-y nature, we were quite surprised at how much gear juggling needs to be carried out when travelling at lower speeds and constantly having to turn the thing around for photographic reasons started to grate. Still, this is a machine that’s predominantly designed for posing and the fact that the new engine seemingly takes up 80 per cent of the bike, it never fails to draw admiring onlookers keen on getting to the bottom of this engineering feat. Although, the same bystanders tend to feel a pang of disappointment when the ignition switch is flicked and the 114 engine quietly rumbles into life. We know that ever-stricter emissions and noise restrictions mean the standard mufflers need to be quiet but we’d be inclined to rip these standard issue pipes off in a flash and replace them with something far fruiter. It only seems fair to that engine. 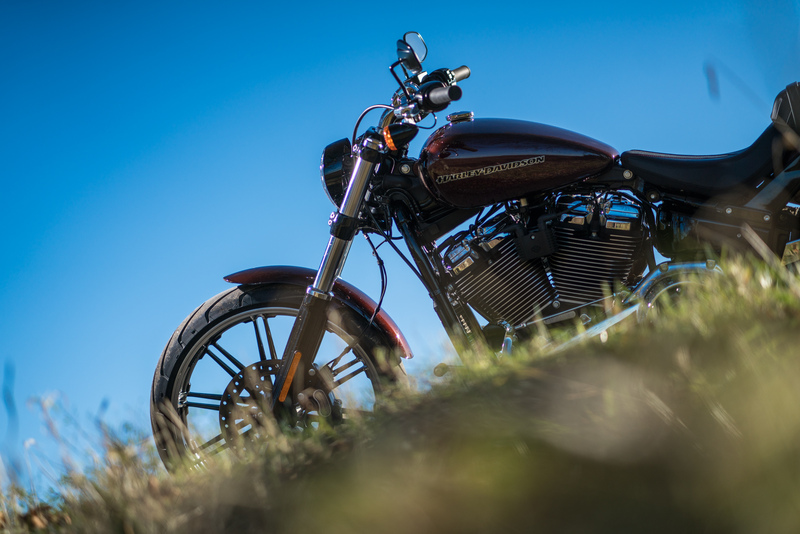 Long, low and stupendously over-muscled, the new Breakout is most certainly up there with some of H-D’s most visually arresting modern creations. The addition of some neat 21st Century tech ensures it looks bang up to date but it features enough testosterone-fuelled touches to keep those admiring glares trained on its chrome parts. We can’t comment on the standard 107 engine but this larger unit seems to suit the bike’s personality to the ground. Bags of torque, a surprising turn of pace and the potential to sound truly deafening are just a few reasons to fall in love. 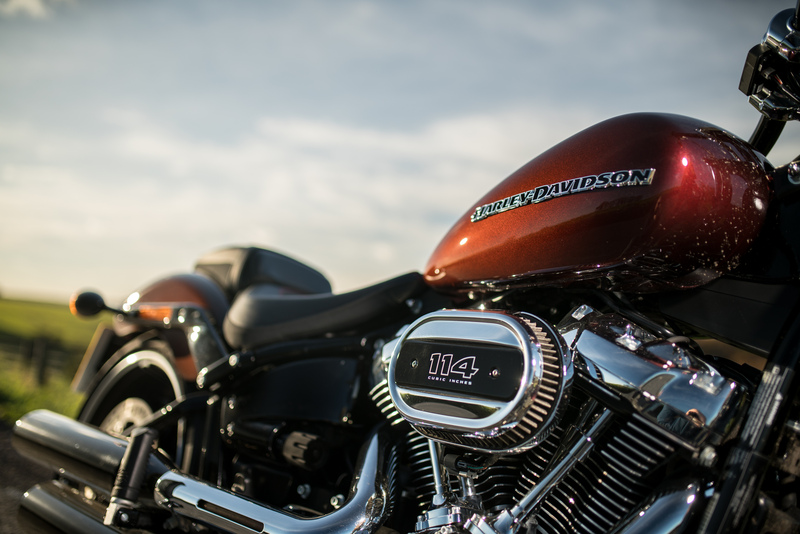 Alas, it remains a ridiculously expensive proposition and we can’t help thinking that Harley-Davidson has become a little too comfortable in its position as market leaders. Some of the small details seem a bit cheap for such an expensive machine and the customer will be tempted to part with even more money in order to personalise the bike to taste. But that’s always been the Harley way and customers are clearly happy to pay for such an epic piece of machinery. We can appreciate that.